Okay - just one more sleep to 2011. What are we all doing for New Year's Eve? We will be drinking champagne here because Ian is sure we have finally had a win after nearly 3 years - the Town of Vincent have had a noise testing machine here this morning and even they thought we may have been suffering for rather too long with the air con (yes still on hot and running 24/7) next door. You can even hear it when you are in the shower. The tenant has disappeared leaving all the doors and windows open. When I paid our electricity bill today I did wonder what theirs will be like..... painful. It's hot and going to be hotter - talking 40. Hiding indoors will be the answer and hoping the sea breeze (the Doctor) arrives in time for our bbqs. This little gem is a bit of sampling for my hot Needles Cool Stitches workshop which is all falling into place nicely. I shall be emailing all students who have enrolled already, in the next day or two. Just tarting up my portal for us to use. If you are on facebookdo go our page and click on like - I will be offering various giveaways throughout January. Just as well someone told me that the post office was having another day off tomorrow - we had to go like mad to get all the orders done and after lunch the latest CPS #34 arrived so we worked like mad some more and got eveything away so that people should have them on Tuesday when the p.o. opens again.We actually have a few spare copies this round. For all those people emailing to ask about the lovely pastel sari ribbon, I can assure you that I will tell you and Ian will load it to the web as soon as they arrive. In the meantime we should have a shipment arrive tomorrow from a different factory in India full of lots of new exciting yarns. I shall be hanging out for Harry the UPS man. Off to make my curry - but I think we will enjoy it out in the garden. Here is my latest bit of ironing - this hank of sari ribbon only took 1 hour but it was very hot at 9pm in the studio last night even with the air con on and I did iron fast to get away. You will be wondering about these colours and I am too - way out of my colour zone - sort of Rose Quartz and Vanilla Beans rolled into one. Take note Jacinta. I am planning a long piece of slow cloth - one which might take me quite a while and I will need clean hands to work on it. I need to start gathering threads for hand stitching but I do have serious ideas for what I do with it so watch this space - later rather than sooner. This colour is a sample which I have - I have been waiting patiently for my order of sair ribbon placed at the end of October - there has been a major accident in the factory but today I got an email saying all was well and back to work tomorrow so hopefully it won't be long until everything is here. It is always so frustrating waiting. I spent the morning creating and packaging our new Little Yarn Bitz Bags - 10 different themes with 200 grams of different yarns in each. 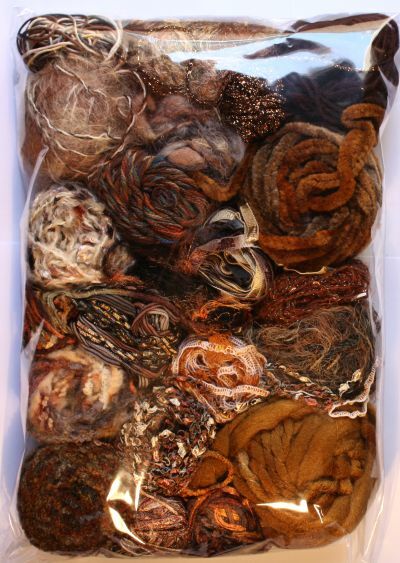 Each is unique because while I have plenty of some yarns, others are from my big basket of treasures and once gone never seen again. Ian was so impressed with my work that he loaded them onto the web straight away. He spent all of Boxing Day adding a new colour chart for all of the Starburst Sprays which looks great. Tonight we are off to the movies at last - to The King's Speech - looking forward to it. 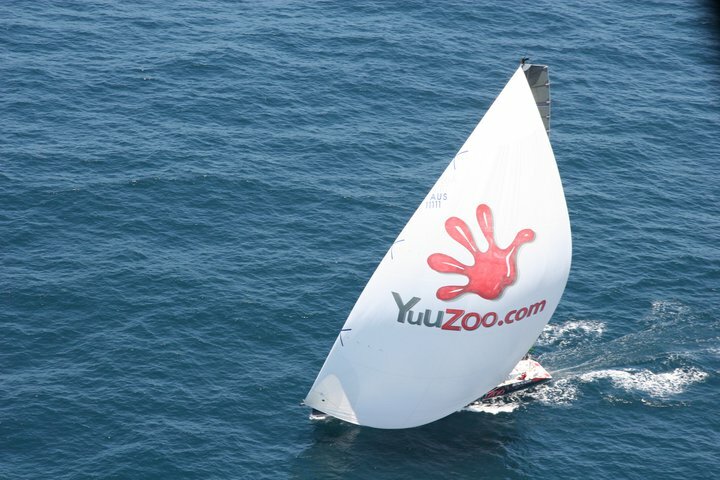 Grant is back in Sydney looking forward to working on and sailing his 18ft skiff and going kite surfing. Much better idea. 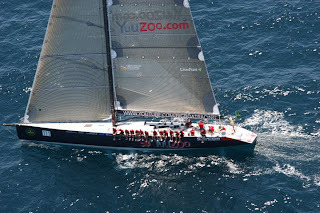 He did say it wasn't as dramatic as reported although lots of the crew were sea sick. I have told Bruce to be very careful riding his bike.... We have also been watching the cricket - something we don't usually do but it is all a wee bit fascinating this round especially with the captain blowing a gasket. Carolyn - thanks for your lovely message - I visit your blogs often and am always inspired. Lyn - what you suggest sounds great - and I will have to do some hand stitch but do post pics when you get done. I might do some weaving with some first. I have to admit I could have ironed faster but it was a hot day. It is worth ironing the sari ribbon out though. I haven't done any more to my piece but I have plans for top decoration. And of course if it is to be a cushion it will need a back. Does it need to be a cushion? Was going to today but got a little sidetracked. In fact we were going to go to the movies but that will be tomorrow - we couldn't drag ourselves away from the 'puters and telly. But we are going off to get fish and chips and take them down to the river where there might just be a sea breeze - it has been 40 today. I also have a couple of pages of my pages for The Sketchbook Project - the deadline will loom up fast. Mine is titled This is Not a Sketchbook so it isn't. The pages are pretty flimsy so I have cut some out and replaced and gessoed some together. Still a way to go though.The paper on the left is a photcopy of some of my stitch and I have still to finish this page. We are up bright and early - well not really - we had a sleep in. It is very windy here in Perth but also very hot already. 40 degrees yesterday so we had a quiet relaxing day at home indoors. - I only went from house to studio and back again. Packed up my machine and bought out my Orchidea which I dusted and cleaned and turned on.It stills works very well. It is funny how you get used to something new and what was exceptionally modern is now quite outdated - but still good. As you can see, I have cut up some of the sari fabric and restitched - about the size of a cushion. I decided to use my Indian Splendour embroiderythread - what could be more appropriate? 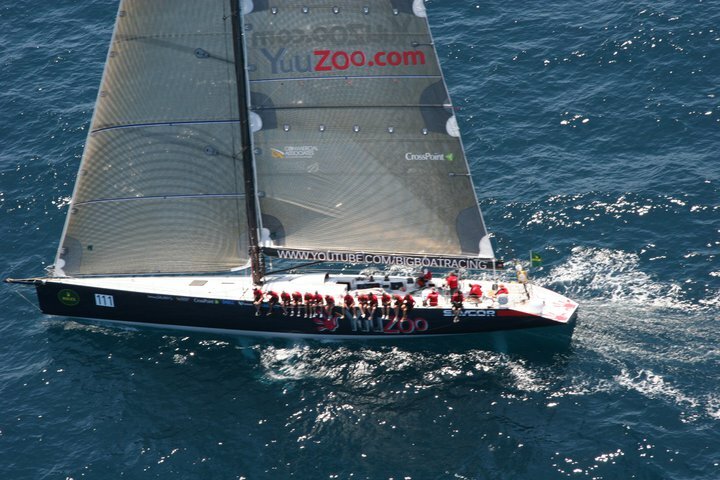 We are waiting for the start of the Sydney to Hobart and hoping that Grant has a great sail and that they arrive in Hobart safely. my waterlily is out but right now asleep before it starts the day - here are my roses instead - red white and green leaves. well in that I managed to do the shopping and the last orders have been sent and Ian has turned his computer off and is relaxing. I have my sari hank to show - I have bonded it to a backing in the order that it came off the roll and left a little when I ran out of backing. Now I am stitching rows with decorative stitch. on the other hand all is not well because my Husqvarna went ping and died so I am back to the Bernina with its small stitches and once I have unplugged the Husq ready to take it in next week, I shall pull out my Orchidea and see if it still works. I haven't used it for a long time. I wanted to try some bigger patterns but it doesn't really matter I guess. I am still deciding what I shall do with it next. Obviously I am going to cut it up and reasemble it but not decided for what. It could make a great cushion, or book covers or bags or? Lots more stitching though - this is something I learnt from Val Campbell-Harding. Been off to have my hair refuschied (for Christmas?) - the streets in Mt Hawthorn were unusually quiet.It's very hot but Ian tells me it's as low as it is going to go for a number of days. Turned on the air con in the studio but it didn't seem to be working. As I was ironing I thought it was just me. Turns out I had the heat cycle on.... At least it was quickly remedied unlike next door's air con which has been going non stop for nearly 2 weeks on hot and they have the doors and windows open and not many clothes. Also means they have to listen to Gin Wigmore up very loud coming from the studio to block out the noise from their cheap and nasty unit. Can only imagine what their electricity bill will be and can only wonder why no-one has come to fix it..... How come you cannot hear my air con from anywhere? Above is one hank of sari ribbon which took me two hours to iron. I am about to use it to make something. Come back and see what before too long. The waterlily is sticking right out of the water but has not flowered yet - I think it is blue. Note to self: do the Christmas shopping tomorrow. Quite a number of years ago in Reefton (like when the boys were very little) I found at the back of one of the old shops, a box of pencils in different sizes and I have used them a lot but suddenly they vanished to where - I do not know. Today a tin of them arrived - I could wrap them up for Christmas really - they are so useful. My first slow cloth is finished - another one on the start. I am pleased with it - if you enlarge you will see my little kiwi. Tiny circles made with the flower stitcher foot and the big ones on the couronne stick. 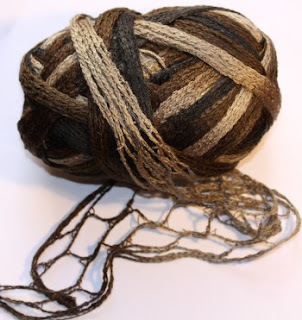 When we were in Spain I found this wonderful yarn called Triana. The shipment finally rocked up today. I wanted to share it! One ball will make a scarf (we have a free pdf on the website in Exotic yarns) but I am more interested in the way it opens out and I can't wait to try it - I think the embellisher may like it - think of layers and stuff - ooohh... There are 11 different colours including black and a cream but these two look like where I am still at. My soul cloth is coming along nicely - I am also thinking of it all as slow coth but I need to learn the meaning of the word 'slow'. Once I have this first one finished or sort of finished (not yet sure how I will finish it) I have ideas for using the process in other ways. The rain only lasted one day and all is back to 'normal' again. Shame. 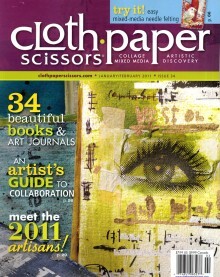 Working on my soul cloth whilst watching Leonard Cohen dvd On The Road. Since we hardly ever watch dvds, Ian had to find batteries and remember how to get it going. I have been weaving a variety of hand dyed fabics - differentsilks and velvet.It is lovely just to stitch - relaxing stuff. Not sure what's next as I am working without a sketch just as I feel. We had lots of rain yesterday which the garden enjoyed. The first waterlily is raring to go and you can all the leaves which are droppingoff the trees - it's been quite windy and we had a little whirlwind of some sort. It's predicted to be 38 on Christmas Day - second hottest of something. Not quite like my friends in the northern hemisphere - I hope you are all surviving the snow and being locked in etc. Busy last couple of days - my working computer (the one which was having grandpa naps in the afternoon) has gone to terminal hospital and after waiting a couple of days I have a new one but of course this means loading all sorts of new things and sorting stuff. So far I have lost most of my favourites but Ian assures me they will be somewhere. Anyway it is easier to use. Just got to make my iphone work again by taking it to hospital on Monday.I am sure I have a dud - I was only trying to synch it..... But we are having enormous pleasure using the iPad and all the new Sonos stuff Grant gave us for Christmas. We have 3 Sonos stations now including one in the bedroom and with the nasty noisy air conditioner going for over a week next door nonstop (I think it is stuck on hot as they have all the doors and windows open and wearing not much in the way of clothing which at least makes me feel marginally better) we can have lovely music coming out of the studio to counter it. I have finished my Okarito book and here are a few pages. It is relaxing and satisfying making these little books. Dry felt, wet felt, needle felt and lots of hand stitch and different types of fabric etc. The idea of slow stitch appeals more and more especially in contrast to the hectic pace at which I try to run. The satisfaction of the needle pottering in and out gives plenty of time for thinking. I have enrolled in Jude Hill's upcoming workshop - spirit cloth - seems to me that her ideas fit nicely with my idea of soul cloth. I have started another set of work based on the West Coast but nothing much to show as yet. I am busy working on samples for my Hot Needles Cool Stitches online workshop which starts on 17th Jan mostly for the embellisher plus. I have a huge pile of samples stacked up for each lesson. Separate the eggs (keep the yolks for the ice-cream). Beat them until they form soft peaks and gradually beat in the sugar until it has all dissolved. Use a spatula to carefully fold in the cornflour and salt and then the vinegar and vanilla. 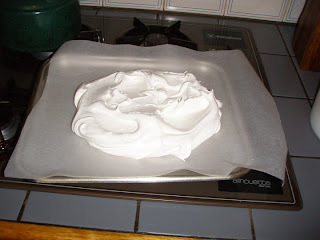 Line your tray with baking parchment (you will have to retrieve it from your studio) and carefully load the mixture (the important thing is to keep it light and fluffy). Cook in oven at 170 degrees (the oven I have these days is more powerful so I set it at 160) for 1 and half hours. Top it with whipped cream, strawberries, kiwifruit and passionfruit or whatever you will. In another bowl beat the cream and the other half of the sugar. My mother used to make sponges - apparently they were considered top class sponges. They came out of the oven and were dropped on the kitchen floor which meant they rose or something - filled with cream and with things shaken through a sieve. As far as I can remember there always seemed to be one on the table. Visitors always said how wonderful they were but they never did much for me. Me - I must have started making pavs sometime - I used to use the recipe in the Edmonds cook book but then Des Britten ran his tv cooking show - I may not even have watched many but I do remember the one where he introduced a garlic crusher and the whole of NZ ran out the next day. When he did his ice-cream I do believe that the milks ran out of cream the next morning. This book was published in 1977 and over the years I have cooked many dishes but now only the pav and ice-cream. This is one of my favourite books which Kaz and Bruce sent me - Boro - the cloth from the Aomori Prefecture in northern Japan (not as far north as Kaz and Bruce though) - an area synonymous with dire poverty. The Textiles created were but mere 'rags' and of course these days they would be highly desirable. It gets one thinking about the soul and things that matter and mean something to you. This is a coat from the book - not so clear but it is the idea I am thinking about - things to feed the soul. and a detail of another piece - maybe frayed fabrics or fabrics left out in the weather or wrapped or torn or whatever. Lots of food for thought and something I plan to work on in the next year or so. 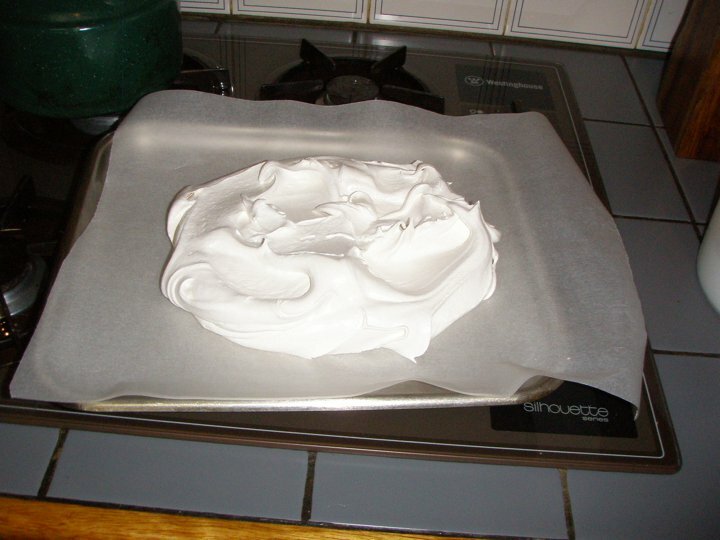 Grant is in Perth for 24 hours and is off to Sydney tonight so our Christmas dinner no 1 is currently cooing in the oven, Here's the pavlova (NZ recipe) all ready to go in the oven this morning. It's now cooked and waiting for its toppings of cream, kiwifruit and strawberries to go with our Des Britten icecream - that's after our roast lamb and roast potatoes, kumeras and parsnips - plus peas with mint sauce. Very trad we are but some prawns first with champagne. Beautiful day in Perth after a lovely night in the garden with friends - should do it more often. I have further worked my leaf this time on kunin felt so it could still be lying about on the forest - I am pleased with the fabric I am experimenting on, puffs up and will be worth experimenting on the embellisher..
Also experimenting with the different weights of Lutradur 70gsm and 130gsm - the fragility of the fabric is what is appealing - a little like the world today. What am I reading and enjoying very much? 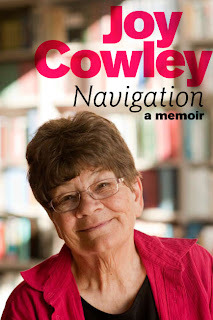 Joy Cowley's memoirs - Navigation.I have always really enjoyed her adult books and eagerly devoured the few she has written. Especially of interest the fact that she grew up in Foxton but before my time. She has a very astute sense of life. A fragile leaf lying on the forest floor. Last night we had a bbq and sat outside listening to the Eagles concert at the part. The wind meant it was a bit distorted at times and the sound bounced off all sorts of things but it was enjoyable.Finally in the encore they sang Desperado but it was o so short. Shame. One of their best songs from the 70s. Still playing with puff paint and stuff - here I have been working black puff through a stencil - one of my favourite stencils over a hand dyed piece of fabric in shades of purples - once heated I rubbed magical mica over the puff. Very easy to stitch but I wold layer with a chiffon scarf as it makes it easier for stitching and then burn it back with my heat gun. While I was tidying up (! ), I found this little Tuscan house I made a few years ago when I was into my Tuscan stuff - the walls of the house have lazertraned images on metal which you can't see very easily and the puff scraped on with a plastic knife and fork (thanks Qantas) and once heated I painted all over with a pearl paint. I made the tiles of the roof with painted Gossamer Fuse bonded to cream panne velvet, cut and rolled and zapped and then rolled so that they looked a bit like the rooves we saw in Tuscany. Pleased to report that the tomato plant is growing and flowers are forming. This could be the year I finally get real tomatoes. All three waterlilies are floating with leaves and hopefully flowers will follow before too long. If you have enrolled in Hot Textiles - Cool Stitches (thank you all very much) I will be in touch tomorrow with such serious matters as a requirement list etc. While we were away in NZ the inaugural Beaufort Street Festival was held. I believe it was a great success - yesterday I saw knitting still wrapped around poles and a hammock in the middle of the road - I must go back an take some photos. I do still have art to wear in my garden growing old gracefully. When you go away for a wee break you always have to make up for it somehow and we have been working away all weekend. Mind you the garden has never looked so good. The bark falling off the Eucalyptus trees is nearly at an end and my one and only tomato plant still looks very promising. I will go off to the shops tomorrow and get the secret ingredients for it and even consider buying a few more plants on the basis of possible success. 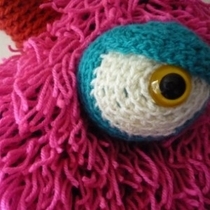 I have finally got my act together and loaded the information on the web for Hot Needles, Cool Stitches workshop which lots of people have been waiting for. I have been doing quite a lot of new exploring and hope that this workshop - the next level for the embellisher - works well. When I was at Ally Pally, I met up with Marion Barnett and she very kindly gave me a copy of her new book - Exquisite Evolon - which was very kind of her. I have not done much as yet but the book is full of lots of ideas and I am hoping to get playing with Evolon very shortly. Thanks Marion. I have done quite a lot fo work with Lutradur which I like but Evolon has a wonderful feel to it - we also have Evolon Plus which is very soft - I can feel some experimenting coming on. Here is a picture of the Reefton railway station - Max used to work there many years ago. It looks pretty uncared for now but we could still see where coal is deposited. This is the Inangahua River just out of Reefton on the way to Blacks Point - Ian's swimming river when he was but young...... it was hot enough to swim when we were there. A waterfall on the road from Springs Junction to Murchison - a new road for me. The Buller River - always a fabulous drive along the Buller - one of my stitched pieces flew out of the car window while we were driving across a bridge - I thought I had bequeathed it to the buller but it was still waiting on the road when I went back for it. The Wairou River on route to Marlborough. The water in the rivers in this neck of the world is good for drinking. And the duck family which followed us along the shore. Her is Mum with her ducklings. We only had time for the bellbird walk this time - lots of bellbirds beautiful sounds. Last time we went on the honeyeaters walk. Next time. Click on any of the picutres to see them nice and big.